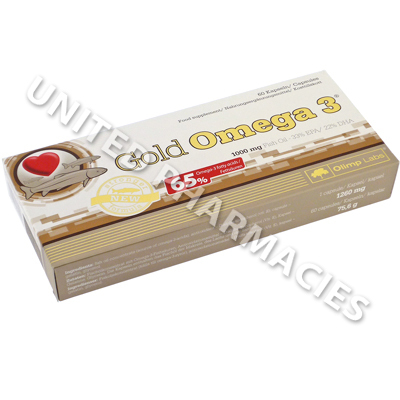 Gold Omega 3 (Fish Oil/Eicosapentaenoic Acid/Docosahexaenoic Acid/Omega-3 Acids/Vitamin E) is a dietary supplement aimed at those who wish to promote a healthy heart. It also helps to maintain normal eyesight and brain function. The high concentration of omega 3 polyunsaturated fatty acids (65 per cent) contained in this supplement are essential for a healthy metabolism and have been shown to have benefits in treating a vast array of diseases. Gold Omega 3 (Fish Oil/Eicosapentaenoic Acid/Docosahexaenoic Acid/Omega-3 Acids/Vitamin E) is a dietary supplement aimed at those who wish to promote a healthy heart. It also helps to maintain normal eyesight and brain function. The high concentration of omega 3 polyunsaturated fatty acids (65 per cent) contained in this supplement are essential for a healthy metabolism and have been shown to have benefits in treating a vast array of diseases, including cardiovascular conditions, autoimmune disorders, cancer, ADHD, depression and other conditions. DHA (a type of omega 3 fatty acid contained in 22 per cent of this supplement) works by reducing the level of thickness of the blood and decreasing triglyceride levels. It is also essential for maintaining healthy eye tissue and nerves. Some people have taken it for AMD (macular degeneration, a type of eye disease). EPA is another fatty acid which consists of 33 per cent of this supplement. It works by making it harder for the blood to clot, and may also relieve pain and treat inflammation. Vitamin E is also contained in this supplement as well as other types of omega 3 oils. Gold Omega 3 (Fish Oil/Eicosapentaenoic Acid/Docosahexaenoic Acid/Omega-3 Acids/Vitamin E) is supplied as capsules for oral administration. Before taking any dietary supplement you must check with your doctor to ensure that it is safe and suitable for you. The amount of omega 3 required can differ for each individual and may depend on the condition requiring treatment. In some cases, doctors recommend that adult patients take 1 capsule per day. However, this is just a guideline and the correct dosage may be different for you. Therefore you must follow the instructions given by your doctor. Side effects should be reported to your doctor. If any rare or serious reactions occur while you are taking this supplement, seek medical attention straight away. If you have an allergy to seafood or fish, there is a possibility that these capsules may not be suitable for you. You must discuss this with your doctor before taking this supplement. This medicine could have negative effects in patients who are sensitive to aspirin. If this applies to you, it is necessary to inform your doctor before taking this supplement. Always use Gold Omega 3 (Fish Oil/Eicosapentaenoic Acid/Docosahexaenoic Acid/Omega-3 Acids/Vitamin E) as you have been prescribed by your doctor. Never self-medicate or change your dosage without first consulting your doctor. The correct dosage can vary depending on your health, medical history, and the severity of the condition being treated.